What is the value of telling the truth? For an independent blog reporter in the midst of the Mexican Drug War, it’s as important as her very life, which is threatened on a daily basis. The internationally famous Blog Del Narco is an anonymously typed blog that documents a rare insider’s views of the elusive and highly violent drug war in Mexico. Hidden by veils of Internet privacy due to death threats, this 30-year-old blogger has become a local hero and is documenting Mexico’s decline. She reveals the horrible savagery of the drug cartels with gruesomely graphic pictures, videos and stories of beheadings, death squads, paramilitary cops in ski masks dragging people off and public humiliation. Blog Del Narco’s highly viewed site (Alexa rated 50 in Mexico, 5,000 in the US, 128,000+ twitter following) has become an international mecca of information into a world that few have gone, and even fewer have lived to tell about. Original handpicked blog entries are formatted to describe an epic and tragic true story that unfolds the savagery of daily life in Mexico. This book contains both the original Spanish-language posts in addition to their English translations. Truth is risky, and sometimes it’s also harsh. Dying for the Truth addresses narco-censorship, government corruption, and an ever-rising death toll all driven by American demand for the products controlled by the cartels and their government collaborators. 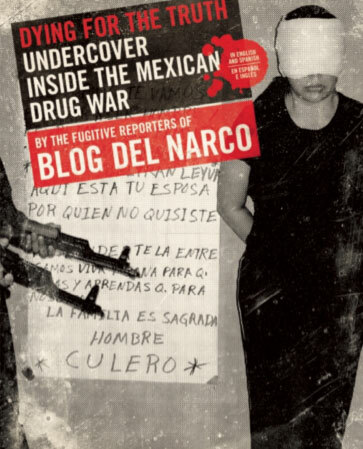 Blog Del Narco has fought back, and in turn, created hope in its people and an immense cult following for truth. The anonymous author is the only person in Mexico daring to write the truth about the violence and corruption of the horrifying drug war in a country that is quickly becoming one of the most dangerous in the world. Her life has been threatened dozens of times, and her informants have often been killed. It’s a certainty she will be horribly murdered. Both the cartels and the government have searched for her. Her crime: reporting the truth. — Publilius Syrus, 1stcentury B.C.